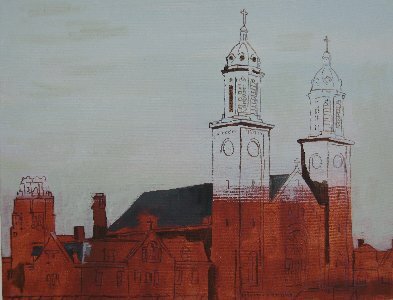 From now until completion, I will be posting periodic updates of a work in progess painting of Corpus Christi Church. The painting is being done by former WNYer & current Williamsburg, Virginia artist, Lisa Wiertel. Lisa’s grandmother was baptized at the church and she has roots in the neighborhood. There is other exciting news surrounding this painting and Corpus Christi coming up which I will fill you in along the way. You can also read more about the painting at the artist’s site.